I wanted to make a simple pouch as a container for a gift, and was looking for a quick pattern. 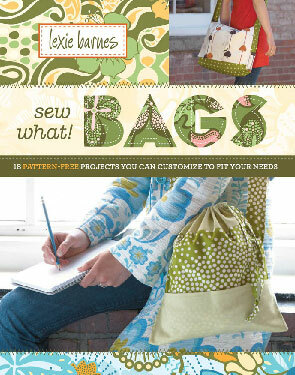 I found a quick pattern for a zippered pouch in my copy of Sew What Bags by Lexie Barnes. I like this really cute pouch, but I decided to make one without the strap. The photo below is screen shot from the book. Looks are deceiving though. 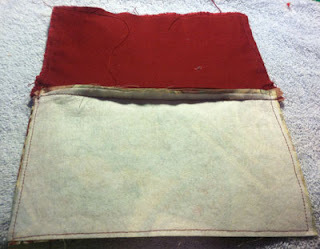 The picture shows a pouch that looks a bit longer than the one I actually ended up making. 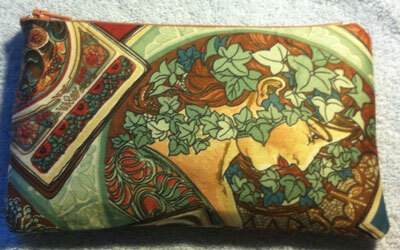 I also found a sample of this same pouch pattern in Craftster. It took a while to select the right materials. I have a stack of fabric samples that I picked up at a garage sale several years ago. I took the fabric samples books apart, cleaned the fabric, and organized the samples by color, but I had not been able to find the right project for using them. The fabric is upholstery fabric, a little heavier than cotton fabrics. My friend is a red head and I found this piece of fabric among these samples. I chose the pattern piece of fabric for the outside and the burgundy shade for the lining. I also have a huge box of zippers in assorted colors and sizes. Matching fabric colors with a zipper color was a bit of challenge, but I think it accomplished an adequate color selection. 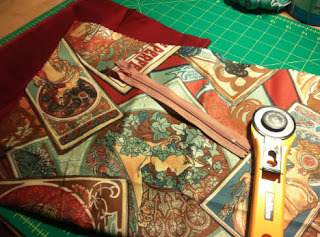 It took me about an hour to cut out and sew the pouch from start to finish. There are several things I might do the next time I make this pouch. First, I'll measure what needs to go inside the pouch. In this case, I was using it to encase a sashiko fabric sampler, some sashiko thread, needles, needle threader and instructions. It turns out that the pouch dimensions were the exact size, but just exactly. It was touch and go there for the moment. I also should have clipped the corners and the outside seam. Here's a photo of the pouch sewed inside out. Here is the finished project. I think it's a great looking pouch. I plan to make many more of them. 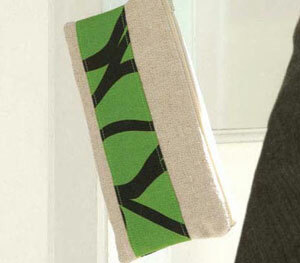 These little pouches would make great christmas presents for a man or woman. Blog about my crafting hobby.